Growing demand from paper and pulp industry for hydrogen peroxide, where it finds usage in bleaching and deinking of the paper and pulp. Deinking is very useful before recycling process of the paper. Global paper & pulp industry was estimated at over USD 550 billion in 2015 and will have a steady growth throughout the forecast timespan. This growth will be supported by rising demand of flexible packaging material in the packaging industry and increasing stationery demand among the education sector. Though the advent of digitalization of information and growth of electronic media will hinder the paper and pulp market, but the growing environmental consciousness in addition to the improved process efficiency is expected to enhance the recycled paper market, hence propelling the global hydrogen peroxide market size. Growing awareness about hydrogen peroxide propylene oxide (HPPO) process where hydrogen peroxide is used as a raw material to manufacture propylene oxide will also drive the global hydrogen peroxide market in the next few years. Ever since the development and commercialization of the process in 2008 in a joint venture between Evonik Industries and ThyssenKrupp Uhde, several other market players including BASF SE have started to use the HPPO process. The growing hydrogen peroxide demand for the process is expected to influence the global market positively. Electronic grade hydrogen peroxide used by itself or combined with sulfuric acid in the manufacturing of semiconductors as an oxidizing or cleaning agent will also have a positive impact on the market. Ongoing research in this field is expected to create huge opportunities soon, which may also dynamically impact hydrogen peroxide market price trends. However, possibility of health hazards due to exposure to the chemical will hinder the market growth in the forecast timespan. It may even form explosive mixtures when in contact with certain organic compounds. Stringent regulations imposed by the authorities upon the usage and hydrogen peroxide concentration in regular applications including medical and industrial applications will threaten the market growth. Paper & pulp industry accounted for over 40% of the global hydrogen peroxide market share in 2015 and is anticipated to maintain the dominance in the next few years. With growing demand for recycled paper in the packaging industry and the global stationery demand, this sector will register a growth at over 5% CAGR in terms of revenue. Global paper & pulp industry may consume hydrogen peroxide worth over USD 2,500 million by 2024. A high growth is also expected in the chemical segment for hydrogen peroxide demand throughout the forecast years. It is forecast to gain some market share from the paper & pulp industry with the increasing commercialization and demand of HPPO process. The growing demand of propylene oxide in the manufacture of several commercial products such as flame retardants, drilling chemicals for oil fields, synthetic lubricants, and others is expected to boost the market. Chemical sector, on a whole, is expected to contribute over USD 2,000 million to the global hydrogen peroxide market size by 2024. Fast growth is also expected in the waste water treatment field with a CAGR above 5.5% in terms of revenue. This growth is based on the growing awareness about environmental protection and government mandating industrial waste water treatment before disposal. Asia Pacific, led by China is expected to have the fastest growth at close to 6% CAGR in terms of revenue. Global shift of paper & pulp industry towards China, India and a few South-East Asian countries owing to cost effective labor force and lenient government norms will drive this growth. 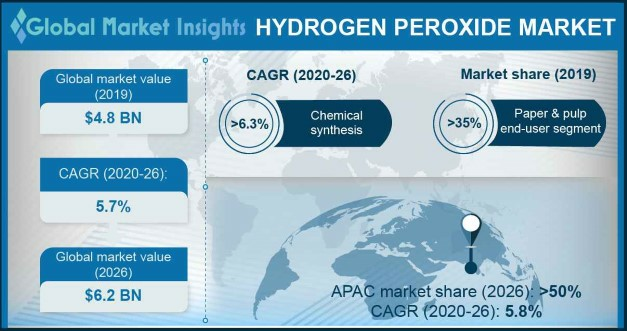 Asia Pacific accounted over half of the global hydrogen peroxide market share in 2015 with an estimated revenue of over USD 2,000 million and will keep dominating the market from 2016 to 2024. North America and Europe hydrogen peroxide market share will lose to Asia Pacific on the account of stringent norms by regulatory bodies such as EPA, FDA and REACH. Also, health hazard regulations mandated by OSHA will act as a restraint. Revenue generated by the North America hydrogen peroxide market is estimated to reach over USD 1,000 million by 2024. Europe had almost a quarter of the global market share and will have a growth at over 4% CAGR in terms of volume. Global hydrogen peroxide market is consolidated and the competitive landscape is expected to witness several mergers and acquisitions. Key participants operating in the hydrogen peroxide market are Kemira Oyj, Evonik Industries AG, Akzo Nobel, Solvay, Mitsubishi, Arkema, Gujarat Alkalies, and Aditya Birla Chemicals Ltd.
With growing demand of paper & pulp industry, Kemira Oyj decided to expand their hydrogen peroxide production plant. Also, companies such as Evonik Industries and Solvay have a series of electronic grade hydrogen peroxide used in the etching of semiconductor boards. Collaborated research and production going on in the field of propylene oxide for the past few years is also expected to have a positive impact on the market. Hydrogen peroxide is a colorless and slightly viscous liquid chemical which finds major application in paper & pulp industry owing to its bleaching property. Alkaline hydrogen peroxide is a very widely used wood pulp bleaching agent in order to enhance the brightness of deinked papers. It is also used as a raw material for the manufacturing of propylene oxide through HPPO process which in turn finds various applications in manufacturing of several commercial materials. Companies such as BASF SE, Dow Chemicals and Solvay have collaborated to use the HPPO technology. The increased demand of propylene oxide is expected to propel the global hydrogen peroxide market from 2016 to 2024.